How Do I Cook Vegetables for Fondue? Fondue is not just a meal; it's an entire culinary experience. A vegetable fondue can be served as an appetizer or a main course. In this communal do-it-yourself meal, pieces of chopped vegetables are cooked individually on long skewers either in hot oil or cheese. The selection of vegetables used is dictated by your taste buds, but some good choices for fondue are peppers, carrots, baby corn, parsnips, zucchini, squash, eggplant and onions. Always exercise extreme caution when eating from a fondue pot as the oil and cheese can reach a very high temperature. Wash and chop a selection of vegetables into bite-sized pieces. Factor in at least 1/2 lb. of food per person if the fondue is going to be served as an appetizer or 1 lb. of food per person as a main course. Any leftover vegetables can be eaten the next day in a stir-fry or dipped in dressing as a snack. Squeeze lemon juice over the chopped vegetables to prevent the vegetables from turning brown. Fill a fondue pot 1/3 of the way full with vegetable oil, grated or cubed cheese and sit the pot directly on the stove burner. 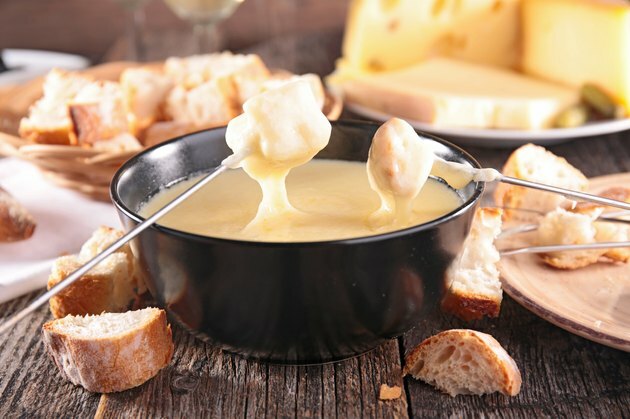 Traditional fondue recipes use gruyere and raclette Swiss cheeses. Heat the fondue to 375 degree F, which is a temperature just below burning. The fondue stand will keep the fondue hot but cannot bring the temperature to near boiling. To test whether the oil is hot enough, dip a piece of bread in the oil with a fondue fork. The bread should turn brown in 30 seconds. Do not heat oil in a frying pan and transfer it to a fondue pot as this is very dangerous and could result in a fire. The cheese will melt and begin to bubble when ready. Stir the melting cheese constantly to ensure that it doesn't burn on the bottom of the fondue pot. Transfer the fondue pot to the fondue stand using a pot holder. Exercise extra caution as the fondue pot will be extremely hot. Dip a piece of vegetable into the hot oil or cheese using a fondue skewer. The vegetables need to cook in the fondue for three to five minutes to fully cook. Slide the cooked vegetable off of the fondue skewer using a second fork and allow the vegetable to cool before eating. This ensures that you do not burn your mouth using the fondue skewer. Never try to put out an oil fire with water. Instead try to cut off the fire's oxygen supply by placing a lid over the fondue pot.